Core-shell particle technology provides striking increases in peak capacity and resolution at lower backpressure, giving chromatographers the ability to achieve ultra-high performance on ANY system, from UHPLC to HPLC to PREP. A uniform porous silica layer is grown around a solid, spherical silica core, providing effective retention and selectivity with improved resolution, speed, and recovery. Next, optimizing the pore size and shell thickness for intact proteins or smaller peptide fragments provides well-defined depth penetration of biomolecules leading to maximum separation power. The thin, porous layer, or "shell", decreases the diffusion path length, thus reducing the time it takes for biomolecules to adsorb/desorb into and out of the particles. Uniform sizing and shape of the particles along with tight packing specifications reduces losses in efficiency and performance due to band broadening. 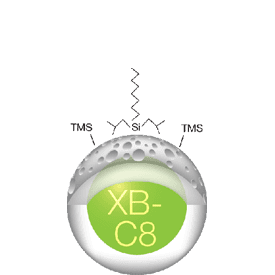 With the emergence of new protein therapeutics, including biosimilars, biobetters and ADCs, peptide mapping by LC/MS is becoming more commonly used for the identification of post-translational modifications (PTMs), glycosylation, and conjugation sites, as well as primary sequence confirmation.